An environmentally friendly product based on plant and mineral-based biodegradable ingredients formulated to cut through soap scum, hard water and rust, leaving showers naturally clean. GreenEarth’s Shower Cleaner contains natural citric and lactic acids plus plant based detergents for an extremely effective lime scale removal. 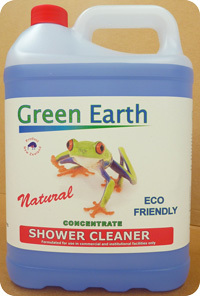 GreenEarth Shower Cleaner is tough on soap scum and bathroom dirt leaving showers sparkling clean!.